My Aruba Scuba Diving Vacation! 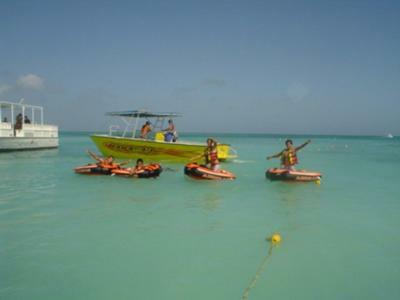 Being on the small island of Aruba could never be the same without a scuba diving experience. As soon as I flew in I knew it wouldn't be long till I headed to the nearest scuba diving center, and I was right! On my second day I was out in the warm green-blue waters on a small boat heading for a local war ship wreck. It was a German fighter called Antilla that had sunk just 10 minutes away from Aruba's shores. Although, part of the wreck stuck out of the ocean there were parts of the boat that was submerged as far down as 60ft (18m). Supposedly, the ship was sabotaged by her own captain as she was surrounded by Dutch forces. He had stated he would rather it be at the bottom of the ocean than give it to the Dutch forces! All this was an exciting warm up for my dive in Aruba waters! The dive was everything I expected it to be. It was a magical mixture of history, beauty and wildlife. Many colorful fish such as parrot fish swam around and although I could not take any photos it was a memory that will always stick with me. After the dive, we all headed back to the beach for a much needed doughnut ride behind the boats! Great fun, and if anyone hasn't tried it... I suggest you do :-) Anyway, that was my diving experience in Aruba! I have also scuba dived in the Mediterranean and I must say I preferred this wonderful Caribbean paradise! Join in and write your own page! It's easy to do. How? Simply click here to return to Diving in Aruba.